If ever you lose a tooth or you need to get your teeth replaced due to extreme dental caries and tooth decay, dentists will recommend the use of dentures to fix the condition. Dentures or false teeth have been in existence since the 7th century when ancient humans were using bands of cut stones and animal dentition as replacement for their loss teeth. Nowadays, whether partial or full, dentures are more natural-looking and are custom-made to suit the person’s oral and facial structure – all for the comfort and usability of the wearer. Lately however, dental technologists and researchers have discovered the potency of 3D printing for replacing lost tooth or teeth. 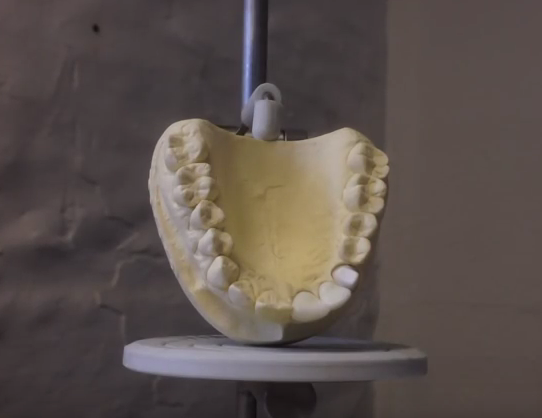 Dental science is now moving from the phase of using gruesomely tasting plaster cast to the era of employing high tech digital scanning and 3D printing methods, with the end-product being made from innovative materials that can alter the course of dental and oral sanitation. A group of chemists and bio-engineers at the University of Groningen in The Netherlands, headed by Andreas Herrmann, have developed a plastic substance that has an antibacterial effect inside the mouth. The material can be moulded into the form of teeth via 3D printing. Having artificial teeth made up of materials that can kill bad microbes is a significant breakthrough, since regular dentures contain germs which cause patients to spend more money on additional treatments. The material can kill bacteria on contact, but on the other hand, it’s not harmful to human cells. This is the assertion made by Professor Herrmann. He further elaborates that he and his team merged the mixture with antimicrobial quaternary ammonium salts together with dental resin compounds. These salts have a positive electrical charge that, once they come in contact with negatively charged harmful bacteria, will cause the latter to rupture instantly and die. The concoction is placed in the 3D printer to be moulded and formed into dentures. It will then be hardened with the use of ultraviolet light. To test if the newly formed artificial teeth can indeed kill microbes, the team dipped them with some mixes of saliva containing strains of Streptococcus bacteria, the main culprit in causing tooth decay. The result of the test showed that 99% of the Streptococci were eliminated as compared to the usual dentures with no mixture of antimicrobial salts. Professor Herrmann and his team admit that, since the experiment lasted for 6 days only, further evaluations (such as extending the duration of the saliva sample interacting with bacteria) are still required before the product is released to the general dental community for use among their patients. They also need to measure if their newly discovered plastic material is hefty enough to sustain the work and function of teeth, and if such material does not have negative reactions to normal dental cleaning tools. “For clinical use, we need to extend this and investigate the compatibility with toothpaste,” says Professor Herrmann.